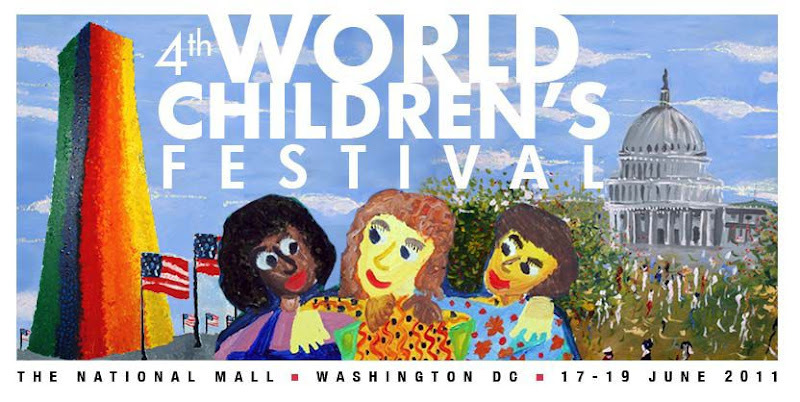 The world’s largest international children’s celebration?Like “Olympics” of children’s creativity and imagination? Adults can participate too! Even preschoolers and seniors. Dazzling performances by children’s troupes. A drumming circle by parents’ group. Age appropriate workshops and activities by famous artists and Olympians. Art therapy and digital technology. DNA and science. Math and music. Architecture and engineering. Animation and design.On The National Mall in Washington DC on June 17-19, 2011. Absolutely free and open to all! To address the most serious challenges that children face. The daily themes of the 3-day festival are:Environment + Health Day(Friday, June 17)instruction is informational, spotlighting common concerns shared by childrenCreativity + Imagination Day(Saturday, June 18)learning is participatory, kindling children’s inherent talents and potentialPeace + Leadership Day(Sunday, June 19)training is inspirational, urging children to build creative and healthy communities.